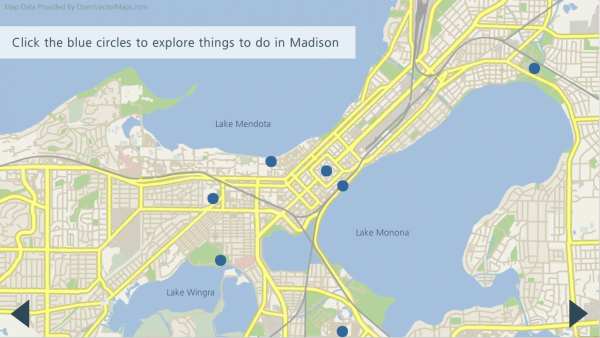 I decided to revisit past eLearning challenges and create a project for Challenge #86: Creating an Interactive Map. 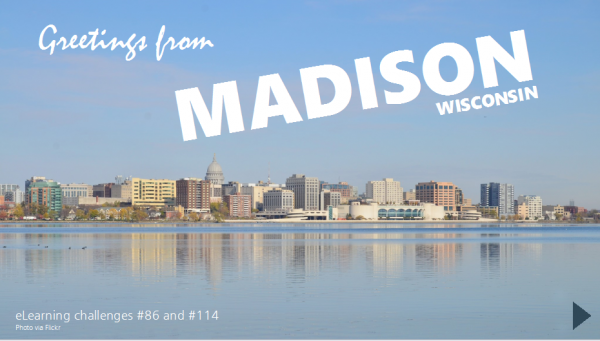 The Madison area is geographically interesting and it has some really neat places to visit. While I was fiddling around with Google Maps trying to see if I could get a version without landmarks, I realized how great it would be to add a zoom element to the interaction. Zooming in allows the learner to see the bigger geographical context, as well as finer details. This let me count this interaction for Challenge #114: Zooming and Magnifying Images, too. I downloaded my map from OpenVectorMaps.com and then chose seven of my favorite locations to highlight. 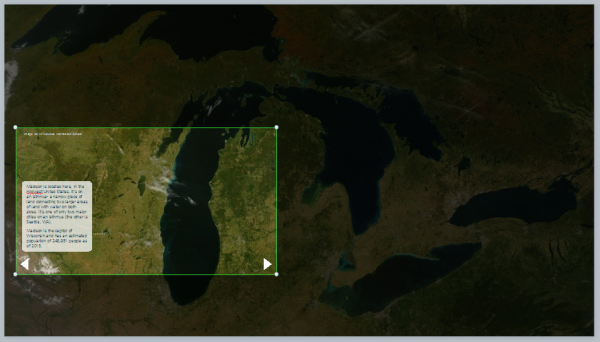 This interaction had two images that were zoomed: a satellite image of the Great Lakes region to give context about where Madison is and the actual map of Madison. Adding zoom regions is more difficult than it appears. In Storyline 2, the zoom region doesn’t have a property inspector, so you can’t precisely define how much smaller than the original you want it to be and where exactly the region should be. Additionally, you can’t define the time it takes to complete the zoom in seconds the way you can with transitions or animations. I had to play around with the zoom region size and speed until it looked ok without being jarring. Once I had the zoom region placed, I could start to add in other elements. The elements I added had to be very small to look normal sized when the region was zoomed. The photo credit text ended up being 5 point font! For the arrows, I couldn’t just copy and paste from an existing slide because they’d be the wrong size. Since I didn’t know what percentage of the screen is shown when zoomed, I couldn’t mathematically figure out how big to make them and where to place them. To get around this problem, I put the arrows in the approximate location, then previewed the entire project. I viewed the map slide after this one to determine where the arrows should go, then used post-it notes on my monitor to create a temporary template. With this, I was then able to make the necessary changes. In the slides for the main map interaction, there was a zoom region on each slide for each landmark. I created one slide exactly the way I wanted it to behave, then duplicated it for the other six landmarks. If I didn’t do that, there’s no way I would have been able to stay consistent with the zoom region size. Besides just the zoom region, I also had a semi-transparent rectangle, a photo, and information to display about each landmark. I used the fly in/fly out animations to animate all three as a group. Click here to see the full interaction. Click to download the .story file.